In the 1980s, Beach Boy and onetime studio wonder Brian Wilson is broken, confused man, and under the 24-hour watch of a controlling psychotherapist, Dr. Eugene Landy. While shopping for a Cadillac, Wilson meets Melinda Ledbetter, a salesperson to whom he is evidently attracted. He secretly passes her a note on a business card: "Lonely. Scared. Frightened." Soon, he begins to tell her his story. And then we see the earlier Wilson, of the 1960s. After an apparent panic attack on an airplane, he begs off the touring life, seeking to the stay in the studio and work with studio musicians back home in Los Angeles. 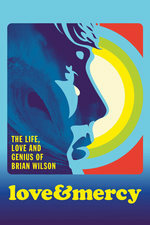 The band obliges, whereupon Wilson produces groundbreaking work including the "Pet Sounds" album. Later, though, he struggles with emerging psychosis as he attempts to craft his avant-garde pop masterpiece, "Smile." While telling this story, the film repeatedly flashes forward to the '80s story of Wilson, Landy, and Ledbetter, with whom he is falling in love, and vice versa. While this make it sound like more of the same in the music biopic department, "Love & Mercy" is anything but. It's more of an abstraction of the usual, instead, crossed with look into the creative process of Wilson and the studio musicians' collective known as The Wrecking Crew, the relationship of the Wilson brothers, and the Beach Boys, as well as Wilson, Landy, and current wife Melinda. The film features Paul Dano as the young Brian Wilson, John Cusack as the 1980s Wilson, Elizabeth Banks as Ledbetter, and Paul Giamatti as (the former Dr.) Landy. This sounds fascinating all-around, from the direction, acting and score. In this interview with some of the key cast members, John Cusack calls the biopic Brian Wilson: I Just Wasn't Made for These Times (1995) "a companion piece" to Love & Mercy. Worth seeing on the big screen, although it took me a while to get into it. Paul Dano is spectacular. Cusack's very good too, but there's something so canny about his presence in any film that I had a hard time buying that his Wilson ever went off the deep end. I was very glad that the filmmakers took the time in the end credits to let us know about the wellbeing of Gloria, Wilson's cook/home health aide during the Landy years. She played a critical part in his escape from Landy despite Landy's threatening to have her deported if she ever said anything. I really loved the Dano half - like one of the best films of the year loved - but the Cusack half really left me cold. It's hard to believe that those two halves were made by the same director and the same crew. What's well paced and nuanced in the early days becomes sloppy and predictable and almost MOMMY DEAREST in the later years. Landy is frightening and horrible, but Giamatti turns him into almost comic relief and it's a damn shame. I thought Giamatti was really good in this, actually. For some reason this film really worked for me. Maybe because, as my wife pointed out, it didn't follow the convention of "celebrity makes it big only to lose it all to drugs and alcohol" in the same way as many other movies of its genre. It could have been that movie, but it wasn't. Just got a chance to see this and liked it quite a bit although I did like the '60s parts better than the '80s sections but that might just be a bias toward the subject matter in each. I loved the focus on the burden of the creative process in the Dano scenes and would never be as interested in the rock star recovery story in the Cusack ones. At the very, very end - there's a bit where 80's Wilson is talking to Ledbetter while they're standing in front of the lot where Wilson's childhood home was. But we don't hear what they're saying, because "Wouldn't It Be Nice" starts to play over them. And gradually, as the film fades to black, the sound starts to change too - smearing into fuzziness. It hit me as I was watching that that "hey, maybe that's how Brian Wilson hears things sometimes." And right after I thought that, the sound turned into this gorgeous ethereal chord, and it left me with the feeling that "oh, everything's okay for him now." It was a really, really subtle detail, but I liked it.